Eltronicschool. 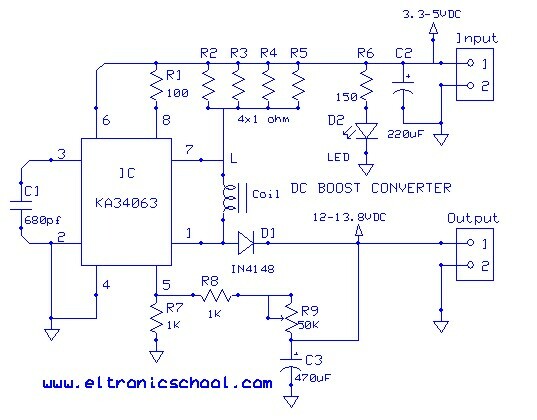 - One the DC to DC converter IC that will help you to create DC converter is KA34063 IC. The KA34063A is a monolithic reoulator subsvstem intended for use as DC to DC converter. This device contains a temperature compensated bandgap reference, a duty-cycle control oscillator, driver and high current output switch. In this time, based on KA34063 DC to DC converter IC, we will give you one of electronic circuit schematic of boost converter that can produce output voltage 12 - 13.8 VDC from the input 3.3 - 5 VDC like in Figure 1. below. We adopt this circuit of 3.3 - 5 VDC to 12 - 13.8 VDC Boost Converter using KA34063 IC from Eleccircuit that publish this circuit with little different part of component value. Eleccircuit describe that this DC boost converter circuit that can use 3.3V to 5V power supply source into DC 12V-13.8V output max current 100mA. It is switching circuit better than old circuit. With this circuit, you can increase low voltage battery to high voltage load as you need with high efficiency. The circuit will show in Figure 1. above, the operation start with when we apply the power supply to the circuit. The IC1 will acts as the step up voltage converter. The voltage will increased to pin 1 of IC1-KA34063 through diode D1 to OUT point. We can adjust the output voltage by adjusting at VR1.